Biological system inevitably produces reactive oxygen species (ROS) like superoxide (O2−), hydroxyl (OH−), peroxyl (RO2−), alkoxyl (RO−), etc. and reactive nitrogen species (RNS). Oxidative stress occurs when biological system failed to neutralize and eliminate the generated free radicals and active intermediates. 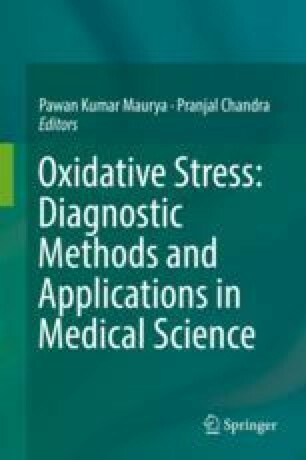 To fight with the oxidative stress caused by ROS and RNS, animal and human cells have developed a ubiquitous antioxidant defense system consisting of superoxide dismutase (SOD), catalase (CAT), glutathione peroxidase (GPx), and glutathione reductase (GR) together with lot of other low-molecular-weight antioxidants such as ascorbate, α-tocopherol, glutathione (GSH), etc. Sometime this antioxidant defense system failed to neutralize and eliminate all the generated ROS and RNS due to various pathological and environmental factors. An increase level of ROS elicited oxidative damage to DNA and other biomolecules, leading to impair normal functions of tissue cells and lead to various diseases. Authors would like to thank the in-house research facility provided by the Amity University Uttar Pradesh, India. Noori S. An overview of oxidative stress and antioxidant defensive system. Open Access Sci Rep. 2012; doi: 10.4172/scientificreports.413.